Congressional Pay: The "trolling members of Congress about getting paid" stage of shutdown drama. We’re at that part of the government shutdown news cycle when members of Congress troll each other—and activists troll them—about their pay. If the government “shuts down,” hundreds of thousands of federal employees don’t get paychecks. Most dangerously, from a political perspective, members of the military don’t get paid. 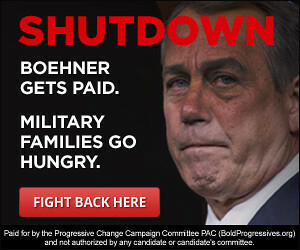 The public shaming can be summarized by this Web ad from the Progressive Change Campaign Committee. But this year the trolling is reaching new heights. The most politically viable addition to the CR—one that would satisfy Republicans that they’re hacking away at Obamacare—would be some version of Sen. David Vitter’s amendment to nix subsidies for the health care of congressional staffers. Sen. Barbara Boxer, who had threatened to introduce a purely trolling amendment attacking Vitter’s reported use of prostitutes if the senator went through with this, took another chance today to deride him. “No United States senator is forced in any way from taking a large employer contribution to their health care,” she said. “Sen. Vitter, today, yesterday, or several years ago, could have said I don’t want this employer benefit—could have sent this check back to the Treasury. He could also call in his staff and say, I’ve been thinking about it, I don’t think you deserve to have an employer contribution for your health care. Therefore your pay will now be reduced to equal the size of your contribution, and I am sending it back to the Treasury. This is something that could be done right now. You don’t need legislation to do it.” At the same press event where Boxer said all this, she was asked three times whether it was “fair” for members of Congress to get paid if the government shut down. The question, and the TV media’s obsession with it, sort of underscores why the Vitter gambit is so potentially popular. Attacking the paychecks and health care of people inside the dome saves a marginal amount of money, but damn, it’s satisfying! Boxer couldn’t even resist a chance to call out Boehner and back her legislation to … deny pay to members of Congress if the government shut down. “If he’s gonna force pain on everyone else,” she said, “he ought to take the pain himself.” Read the rest of Slate’s coverage of the government shutdown.